Keep in-touch with the magic of sustainability! Advice on how to add some "magic" to your own efforts to reach co-workers, students and others effectively with the message of sustainability. Tips on greening your business, home, organization or event - e.g. how to run an event that is Zero Waste...or darn close. News of other creative work being done in the fields of sustainability, environmental education and magic - e.g. learn about America's newest mattress recycling factory (yes, you can recycle mattresses). CJ received his Masters in Environmental Management from Yale University. He served as Yale's recycling coordinator for more than 20 years. 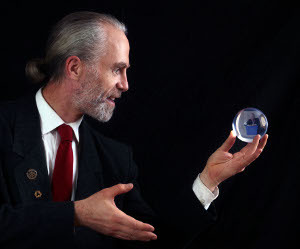 He combines real-world knowledge of environmental issues with his talents as magician and storyteller to enchant and educate his audiences.